DEAN JORGE Bocobo of Philippine Commentary asks: "Can the big idea behind Namfrel be saved?" This question becomes relevant particularly because for the first time since I can remember, Namfrel always finishes its quick count first. But no, not this election. In response, I will put forward the idea of using a cameraphone to do the trick and save the Namfrel count, which, under the scheme being proposed by DJB, will no longer be a quickcount but a parallel count for verification. Actually, before leaving home for office, where I wrote and uploaded this previous post, I took a picture of the 2nd copy of the Election Return, which was posted at the precinct for 48 hours after the elections and my wife retrieved later for submission to the Comelec. You may want to click on the picture and see it for yourselves. 1. A 2-megapixel cameraphone will not do the trick. I used my Nokia 6288 for the purpose, and the resulting image is not up to par. Probably cameraphones with a 4-MP and above capability will handle the job better. 2. 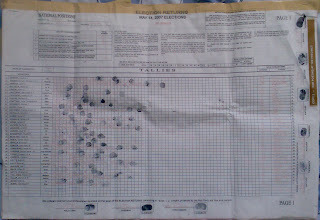 The information written by the poll clerk (2nd member of the BEI) is not legible. The seven copies of the ERs are carbonized so that information to be plugged into the forms need only to be written once. If the data source were the first copy -- where the poll clerk wrote the data directly -- and not duplicates, the information should be more readable and useful for a parallel count. 3. A digital camera may actually be the better option. Constrained by current levels of wireless technologies , the use of a digital camera instead of cameraphones makes sense. Why? Because 3G and 3.5G may not be in place nationwide, preventing the use of email on-site to transmit the digital images of ERs untouched and without filesize reduction. Namfrel volunteers, equipped with digital cameras of a minimum specification (which concerned citizens and community organizations can easily make available for the purpose), can take shots of the 1st copy of the ER in addition to their usual watchdog functions, consolidate these at the town center where broadband internet is probably available, and email results for national positions (i.e. senators and party-list) to their central headquarters in Manila. These precinct-level primary data can then be encoded manually for Namfrel's parallel national count in Manila. On the other hand, parallel quick counts for local positions at Namfrel's municipal/city and provincial levels can be based on images of the remaining ERs. But how acceptable and valid can these images be? Can they not be hijacked by vested interests whose intention is actually to substitute their own for the real will of the people spoken through the ballot? Well, in a low-trust society like ours, everything is possible. But I will pay strict attention to when the data was created and transmitted. From our experience, the ER is usually accomplished by around midnight; the digital image should then be created around that time and transmitted no later than 7 am, 24 full hours after the polling precincts opened the day before. And I guess we have no other choice but to trust someone. On this, we will have to trust Namfrel and their partners: two weeks after the May 14 elections, I think they, as a whole, have done what it takes to repair their badly damaged reputation in 2004 when "Hello, Garci!" ruled the day.